available at Naples Square in downtown Naples. 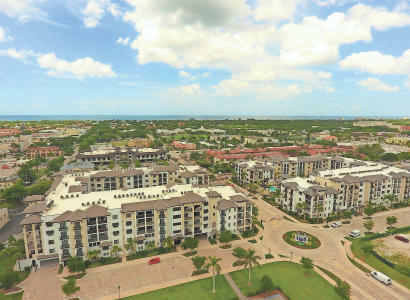 With construction moving closer to completion, and move-in on schedule for next spring, The Ronto Group reported less than two dozen Phase III residences remain available at its Naples Square community at Fifth Avenue South and Goodlette-Frank Road in downtown Naples. Phase III sales transactions worth more than $62 million have been processed to date and the building is more than 70 percent sold. Two of the three furnished models in the Phase III offering that were available for purchase with a leaseback have sold. All three will remain open for viewing upon completion of construction. Three of the Phase III floor plans, the Barton, Dorset and Emerson plans, are sold out. Three previously sold Phase II furnished models remain open for viewing with a sales associate. Naples Square’s walkable lifestyle and the availability of one- and two-story, two- and three-bedroom plus den floor plans with open-concept living areas and open-air terraces continue to transform how people live downtown. Eight Phase III one- and two-story floor plans ranging from 1,460 to 3,238 square feet under air are base priced from $764,000 to $1,724,500. The Phase III plans offer newly designed, enlarged, and re-named iterations of Naples Square’s Phase I residences. The two- and three-bedroom plus den plans feature 10-foot ceilings, open air terraces, and designer kitchens with an enhanced appliance package with a gas cooktop and hood and a wall mounted oven and microwave. The Phase III building’s redesigned courtyard amenity deck offers a significantly enlarged pool deck and a 780-square-foot pool. Base priced at $764,000, the east and west facing Phase III Astoria residences offer 1,460 square feet under air plus a 260-square-foot open-air balcony. The plan includes two bedrooms and two full baths. The great room and the owner’s bedroom open to the balcony. The kitchen’s counter height bar and food preparation area includes a double stainless-steel sink, dishwasher and seating. The plan’s open feeling continues with a dining area that merges with the great room. Four Astoria residences remain available for purchase, including two penthouses, one east facing at $824,000, and one west facing at $814,000. The sold out two-bedroom plus den, two-bath Phase III Barton floor plan offers 1,593 square feet plus a 220-squarefoot open-air balcony. The great room, owner’s bedroom, and guest bedroom open to the balcony. An optional pocketing door is available to provide en suite guest quarters. A counter-height island in the kitchen offers seating as well as a stainless-steel sink, dishwasher and a food preparation area. Base priced at $927,500, the 1,698- square-foot Biltmore plan includes a 242-square-foot open-air balcony. The two-bedroom plus den, great room plan includes a counter-height island kitchen with a stainless-steel sink, dishwasher and food preparation area. The great room, owner’s bedroom, and guest bedroom open to the balcony. The owner’s suite includes a bath with a glass enclosed shower and his and her vanities. Three Biltmore residences are available for purchase. A furnished Biltmore model leaseback is available for $1.11 million. The Phase III Chatham two-bedroom plus den, two-and-a-half bath plan is base priced at $985,000 and includes 1,883 square feet plus a 260-square-foot open-air balcony. The great room, owner’s bedroom, and guest bedroom all open to the balcony. The Chatham is available with courtyard views or east and west city views. The plan features a kitchen with a peninsula counter height bar and food preparation area with a double sink and dishwasher. The owner’s suite includes a bath with a glass enclosed shower and tub and his and her vanities. The Chatham plan will be showcased in one of Ronto’s three Phase III furnished models and is now under contract. Six residences showcasing the Chatham floor plan are available. Two remaining Phase III Chatham penthouses are both west facing priced at $1,066,500 and $1,081,100. With its private, one-car garage and a walk-out balcony that adjoins the home’s ground floor entry, the sold out Phase III Dorset plan lives like a villa or town home. The garage is accessible from the residence. The Dorset residences feature 2,274 square feet with three bedrooms, a den, three baths, a great room and dining room, and a kitchen that includes a counter height island with bar seating. The great room and dining room open to a 269-squarefoot open-air balcony. The Dorset plan’s owner’s suite includes a bath with separate his and her vanities and sinks, a soaking tub, and a glass-enclosed shower. The Phase III Dover plan offers 2,397 square feet plus a 314-square-foot openair balcony. Base priced at $1.221 million, the plan features three bedrooms, a den, three baths, a family room and dining room, an island kitchen, and an L-shaped balcony that wraps the corner of the building. The great room, dining room, and one of the guest bedrooms open to the balcony. The owner’s suite includes a bedroom with a private balcony and a bath with his and her vanities, a soaking tub, glass-enclosed shower, and a separate water closet. Already sold out, the Phase III Emerson plan provides 2,746 square feet of living space. The living room, dining room, owner’s bedroom, and one of the two guest bedrooms open to a 366- square-foot balcony. The plan also includes a den, an island kitchen with counter height bar seating, a foyer with a ceiling detail and crown molding, three-and-a-half baths, and a laundry room. The owner’s suite includes a bath with his and her vanities, a soaking tub, glass enclosed shower, and a separate water closet. The two-story Phase III Fenwick plan offers 3,238 square feet with three bedrooms, three-and-a-half baths, formal living and dining rooms, an island kitchen, powder room, first floor guest suite, and a second floor that includes a flex room, an owner’s suite, a second guest suite, and a laundry room. An optional elevator is available. Priced starting at $1.684 million, the Fenwick plan includes a 323-square-foot open-air balcony off the flex room. A glass enclosed shower, soaking tub, and his and her vanities are included in the owner’s bath. The first floor Fenwick residences include a private one-car garage accessible from the residence. Two downtown Naples sales centers represent Naples Square and Ronto’s Eleven Eleven Central community. One is in Unit 101 of the Naples Square Phase I building at 1030 Third Ave. S. The other is at 100 Goodlette-Frank Road South.